I have a friend in the north of England. He's a fairly quirky individual, and back in 1986, he introduced me to The Smiths and taught me to appreciate vegetarian Indian cuisine. (He's also the only person with whom I've ever gotten into a political "debate" that got physical. I threw a large bottle of laundry detergent at him. As I recall, he deserved it. Colorful days in Thatcher's Britain...) He grew up in Cumbria - the lovely Lake District, where tourists go to look at the pretty sheep and slip, fall, and die trying to walk the Fells. Today, he called and we had one of our fine "is your country entirely mental?!?" discussions. One of my harping points this afternoon was the recent UK chart climb of the dumbass Crazy Frog ringtone. Said my friend, "Ooooh, no! It's gotten much worse!" And it's his own part of England that's to blame for this latest bit of awfulness. In an effort to boost tourism in the Lake District, the Cumbria Tourist Board has built a lovely little website. A fine thing to do, indeed. But you see, the crafy Cumbrians have not stopped there. Creative geniuses they are, they have decided to climb on board the hot ticket express by expanding into the ringtone business. By combining Cumbria's local sheepage with a classic piece of England's musical heritage, the Tourist Board hopes to inspire vacation-seekers to come frolic in their green and pleasant land. Wow, that's really, really awful. 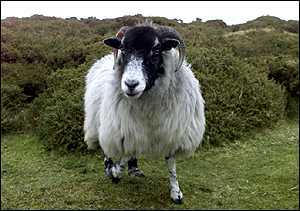 "It is set to become the must-have accessory for hill walkers, shepherds and farmers everywhere – a sheep ringtone! Just as the Crazy Frog craze appealed to the young and urban, it is hoped the reworking of Jerusalem by The Baarmy Sheep of The Lake District, will appeal to those with a love of the countryside and outdoors..."
Well, Blake did mention a lamb and pastures, so maybe we have to cut the ringtone people some slack. Or, maybe not. That really was awful. Oh no! That is hideous! Lol. I love the Lake District, it's one of my favourite places in the UK! And strangely enough I have been studying William Blake poetry recently, well until May when I did an exam on it. But see as one thing that runs throughout is the mention of Lambs...it's technically an appropriate choice! What a wonderful place to go in the summer! My friend from there once made me a tape while he was just walking around, occasionally stopping to have sheep provide commentary. It was hilarious. God, that was back in 1988, my senior year in college. Enjoy the sheep! And be careful if you walk the Fells! !